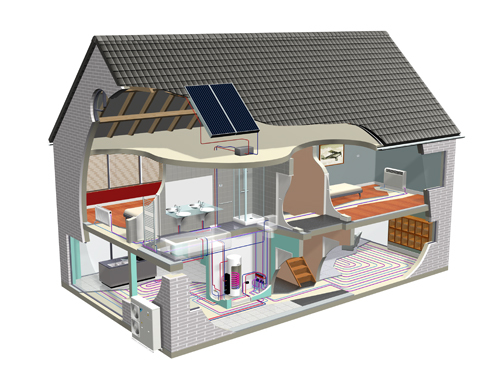 An Air Source Heat Pump (ASHP) system extracts and absorbs thermal heat from the outside air. This heat is then used to heat radiators, underfloor heating systems and provide hot water for your home. It can extract heat from the air even when the outside temperature is as low as -20°C. The extracted heat is then converted for use in a heating and hot water system. The same system can do the reverse in the summer, cooling the inside of your home in the same way that a fridge extracts heat from its inside. Your energy bills will be considerably reduced depending on the system you are replacing. An ASHP system can deliver up to four times more energy than the power needed to run it making this an efficient system to heat any building. An ASHP system is easier and cheaper to install than ground source heat pumps. Ideal for new builds or retro fit. Heat pumps can be used with existing radiators or new fan coil radiators but they work best when partnered with under-floor heating. Air Source Heat Pump systems require very little maintenance. They are called a ‘fit and forget’ technology. An air source heat pump system can help reduce your carbon footprint. CO2 emissions are considerably lower than conventional heating systems by using a renewable, natural source of heat – air. Keltic Heating & Plumbing provide and install air source heat pumps from Daikin. Daikin is one of Europe’s leading manufacturers of highly energy efficient heating, cooling, ventilation and refrigeration solutions for commercial, residential and industrial applications.